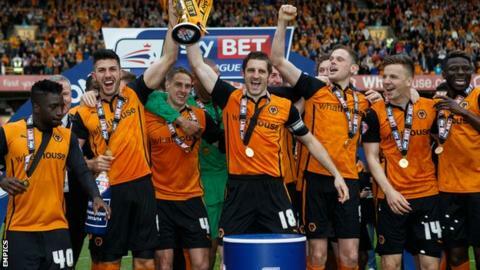 Coventry City have signed former Wolves skipper Sam Ricketts on a one-year contract following his release by their West Midlands rivals. The 33-year-old Wales international defender becomes Sky Blues boss Tony Mowbray's second summer signing. "Since I joined the club last season, I've spoken about the importance of leadership and experience in the dressing room," said Mowbray. "Sam captained Wolves to the League One title when he was an ever-present." Tony Mowbray's Coventry City ended last season five points clear of trouble after coming from behind to win at Crawley on the final day of the season - but they went into that dramatic last afternoon knowing that they could have plunged into the fourth tier of English football for the first time since 1959. Mowbray, whose first summer signing was another defender in Chris Stokes, added: "Sam knows what it takes to get out of this division. He has a wealth of experience at Premier League and Championship level and can play across the back-line as well as in midfield." Former Oxford United, Swansea City, Hull City and Bolton Wanderers defender Ricketts, who has been capped 52 times by Wales, ended last season on loan at his boyhood club Swindon Town, playing for them as a substitute in their League One play-off final defeat by Preston at Wembley. He also had experience early in his career with two now reformed non-league clubs - Nuneaton Borough and Telford United.